Simplify the billing process with clear time reporting on your team’s work. Your team can easily log hours for incidents, problems, releases and other items they work on. They can either track time right in the Service Desk record or in daily timesheets. Either way, you can be sure they’re recording their work, so you can bill the right amount. View reports on time entries. Need to know how much time was spent on a particular company? Or how many hours you worked last week? 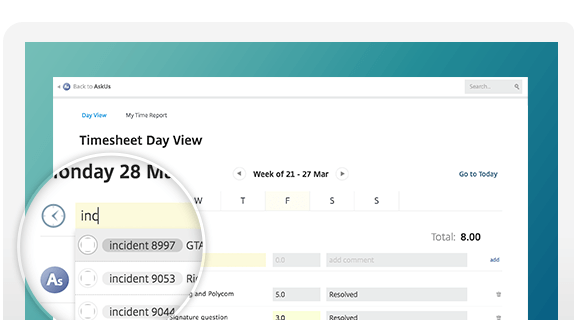 Service Desk lets you generate comprehensive reports on timesheets. Hours are grouped for easy accounting, and you can export the totals as a .CSV file with just a click. As the administrator for your Service Desk account, you can grant your team different levels of permission for time tracking. Restrict access to any of the time features, or let users log hours and view personal reports. You can also bump people up to the admin level so they can run time reports on all users and services.